What if you could approach every part of your life - from the smallest decisions to life's biggest setbacks - with total confidence, clarity, and control? According to Sakyong Mipham, we all have that power. The secret is simple: If you just stop thinking about yourself all the time, happiness and confidence will come naturally. It sounds absurd and, what's more, impossible. 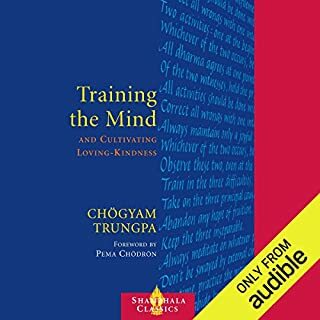 But in Ruling Your World, Sakyong Mipham shares ancient secrets on how to take control of our lives and be successful while cultivating compassion for others and confidence in our own intelligence and goodness. This recording was very dated. It comes from material that was written and taught in the early 1970s. Much of the tone and wording used were geared to that period of time in mind set and focus. If you happened to have been an adult in the late 1960s and early 1970s you will understand what I mean the minute you start listening. The teachings are very anti faith and religion. It does not matter what religion you follow--if you are a person of faith you will most likely be offended by the ideology presented and the instruction to stop "all that nonsense and pain creation". To me this "all or none" approach is limiting and unnecessary. It is possible to practice meditation and mindfulness living in addition to being a faith based person. I agree with another reviewer that Roger Clark, the narrator has perfected the "voice of god-style" of reading. This further adds a level of strangeness to the experience with all the "there is no God" info presented here. Another reviewer suggested that the teachings take on the tone and feeling of "cult instruction". I think that goes a bit too far, but I can see where they got that idea. I think that better editing of this material would have improved the accessibility of the information for modern westerners. The recording has wonderful teachings and insights--you just need to be able to sort out the wheat from the chaff. Discernment is necessary here--as it is in all things. A mixed experience. 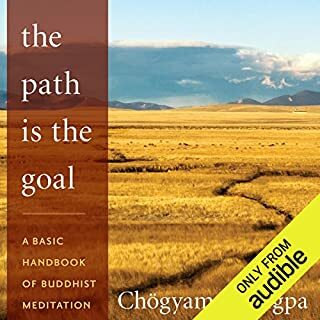 The biggest problem with this audio book is that it does NOT include the forward by Pema Chrodron as advertised. I really want to hear what and has to say about this book. So that is a major disappointment I think Audible should rectify. Talking about the content, I admit I was over my head with this book. 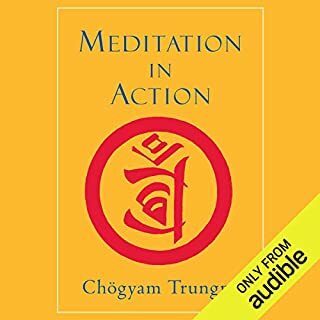 Chogyam Trungpa starts out by saying we need to first look at what Buddhism is. So it sounds like we're going to start out gently. But soon it gets into topics that may make more sense for advanced practicioners, but I wouldn't know. Still, I have listened twice and likely will again in a few months. This all sounds highly unorthodox and really remarkable to me. 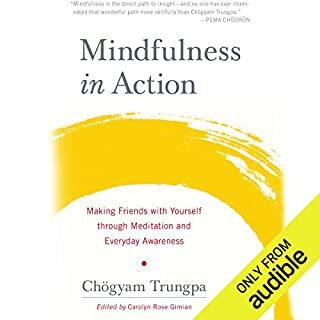 Chatham Trungpa himself was a paradox, so that's another layer on this. An alcoholic who renounced his monastic vows and got married? But still was regarded as a master, for lack of a better term? The book is as remarkable as the man and has taught me a lot. Highly recommended. A bit mind bending. Lots to take in and reflect on. I will be revisiting this many times. Challenging, personal. But totally necessary. 2nd or 3rd time listening to it very easy to listen to. A blessing to have these to listen to. For more experienced practitioners, I believe. Great information with good coverage of the subject matter. A bit dry, so you may wish to space it out instead of binge listening. at things versus the Western world's typical views. I will look for more of this author's books to gain more insight. Very intriguing. Not too cryptic as with his later talks, and this Audiobook ended with such profound view. He wrote and spoke only from his experience,so none of that dry scholarly logic breakdown you find in academic (not experiential) translations. The reader pronounced basic hineyana terns strangely throughout. Not sure if he just had an accent or doesn't pursue dharma. Read at a good pace so the "meat" of the teaching could sink in, but not so slow to lose attention. Loved this book. The narrator was perfect for its reading. and the teachings a must. for anyone who. is on the path. While I have no doubt this info here is powerful, I just couldn't relate most of it to my daily life. Maybe I'm just not ready for a teacher of this caliber yet?!?! Crazy confusing but wonderful . . . 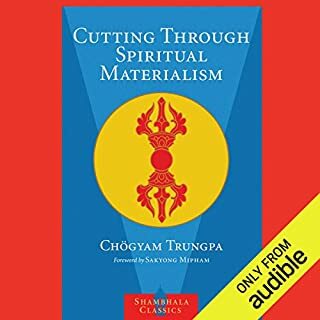 If you've already been studying Buddhist concepts! I wouldn't recommend it otherwise. There are ideas (I say "ideas" even though that's probably not the best word to use) in this book that I hadn't come across before and others that have been reiterated beautifully. Still, at least half of it is a mystery so I will listen to it over and over for a long time just like I have other books of this topic. i would highly recomend this title to anyone it is a brilliantly insightful book and a highly enjoyable listen. 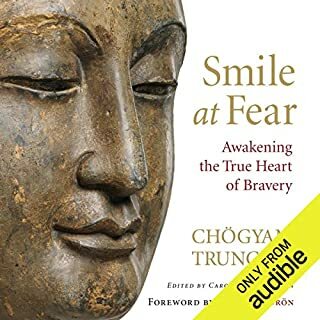 I have now listened to this book a couple of times and i find it really important to my studies of meditation and Buddhist teachings. I find Trungpa books very direct. I will be listening to this several times. well narrated .the end came too soon! 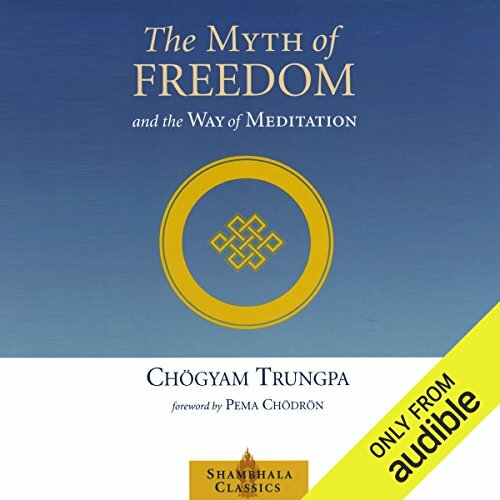 a must if you like books on meditation.